Catholic News World : What is #DivineMercy - FREE Resources - Plenary Indulgence Rules - SHARE! What is #DivineMercy - FREE Resources - Plenary Indulgence Rules - SHARE! 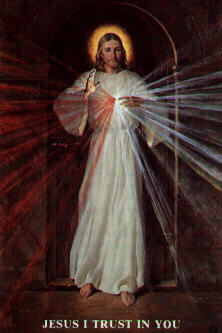 It is important then that we accept the whole message that comes to us from the word of God on this Second Sunday of Easter, which from now on throughout the Church will be called “Divine Mercy Sunday”.She saw a vision of Jesus standing and was told to have the image made with the prayer : JESUS I TRUST IN YOU. The visions that speak of Jesus' great mercy for sinners if they come to him lasted from 1931-1938. Sister Faustina was declared a Saint by Pope John Paul II on in 2000. 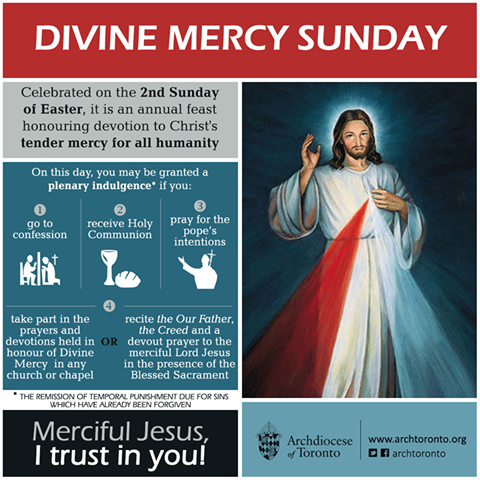 Divine Mercy Sunday was instituted at the same time. It is a universal Feast for the entire Church. The promise of Jesus to St. Faustina was: "I want to grant a complete pardon to the souls that will go to Confession and receive Holy Communion... on the Feast of My mercy. Whoever approaches the Fountain of Life on this day will be granted complete forgiveness of sins and punishment." Our Lord also asked…"I demand from you deeds of mercy, which are to arise out of love for Me. You are to show mercy to your neighbors always and everywhere.